Earn $53.55 in Rewards credit (5355 points) What's This? 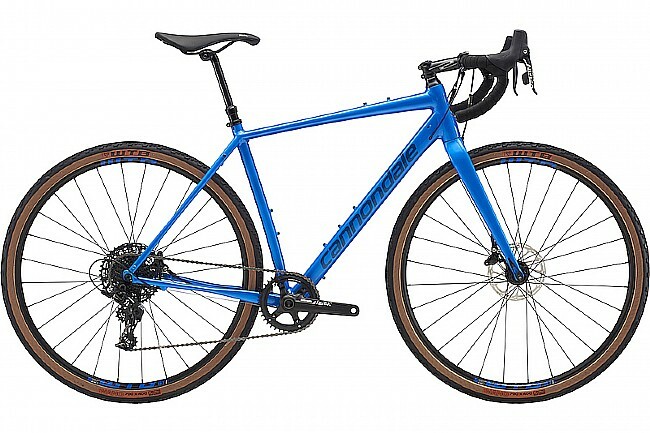 With its high-volume tires, confident rider position and sporty handling, Cannondale's 2019 Topstone Apex 1 Gravel Bike is ready to smash out big miles on the backroads, explore routes less traveled, or smooth out the chop on your morning commute. Frame: SmartForm C2 Alloy, 142x12 thru-axle, tapered headtube, flat mount rear brake, internal cable routing. Fork: Full Carbon, 1-1/4" to 1-1/8" tapered steerer, 55mm offset, flat mount, 12x100 thru axle. Headset: Topstone Si, 25mm Alloy top cap. Shifters: SRAM Apex 1 HRD, 1x11. Rear Derailleur: SRAM Apex 1, Long cage. Crankset: SRAM Apex Alloy, 40T. Cassette: SRAM PG-1130, 11-42, 11-speed. Brakeset: SRAM Apex 1 HRD, 160/160mm Centerline. Handlebar: Cannondale C3, butted 6061 Alloy, 16 deg flare drop. Seatpost: TranzX Dropper Seatpost, 50mm travel, 27.2 x 365mm, internal routing, drop bar remote. Wheelset: WTB ST i23 Light TCS, 28h, tubeless ready. Rims: WTB ST i23 Light TCS, 28h, tubeless ready. Axles: 12x100 front, 12x142 rear. Tires: WTB Nano TCS, 700 x 40c, tubeless ready.